The Guide is correct in saying that Skanska will be putting up white lights on lamp posts for this year’s Christmas season. This is meant as a temporary alternative to the traditional suspended lights across the Village, because there are a number of maintenance concerns relating to the existing lights, which frustratingly are unlikely to be resolved in good time for this year’s season. To give you some background, unlike the Christmas lights in other parts of Lewisham Borough, the existing lights in Blackheath are not operated by the Council, but were acquired some years ago by a consortium of local businesses and had been paid for by local businesses, public donations and financial assistance from Lewisham Council. Throughout the past year, we have been working to assist the operator of the existing lights to try to ensure that all of the existing lights could be switched on this year (including those across the roads). Unfortunately it looks as if the lights might be beyond economic repair. Until recently, we were faced with the real risk that there would be no lights at all, but on examining the terms of Lewisham Council’s new long-term agreement with Skanska (who as you may know are currently replacing all street lamps across the Borough), it became clear that Skanska would be responsible for putting up and maintaining any temporary lighting as provided by the Council. In the short term, the Council’s own lighting budget has allowed for the lamp-post lights for this year. As for the long term, we hope to make a funding proposal to the next Blackheath Assembly on 14 January (along with proposals for other community projects) so that the future of Blackheath’s Christmas lights can be put on a permanently viable footing. As for this year, I hope the weather is kind for the switch-on: 4.30 pm on Saturday 7th December. Whilst on Christmas related events, Age Exchange are doing an open day on Thursday 5th December(10 am – 4 pm) which I understand involves switching on some Christmas lights as well, and there’s the traditional Christmas Eve nativity procession from St Mary’s Church to All Saints Church with carols on the heath, kicking off at 4 pm. As you may recall, I had a lovely £50 voucher from my last disastrous long distance train journey. As I could only redeem it in a station, I checked the prices on Monday morning using thetrainline (£150), then popped over to the station on Tuesday to purchase the tickets. Guess what? They’d gone up by £50 overnight. Following on from an interesting tweet yesterday by @bonniepipkin, an article in The Guide last week implies that this year’s Christmas lights will only be wrapped around the new lamp posts (I refuse to say lighting columns), instead of the traditional hanging festoons. I don’t know whether this is actually the case. 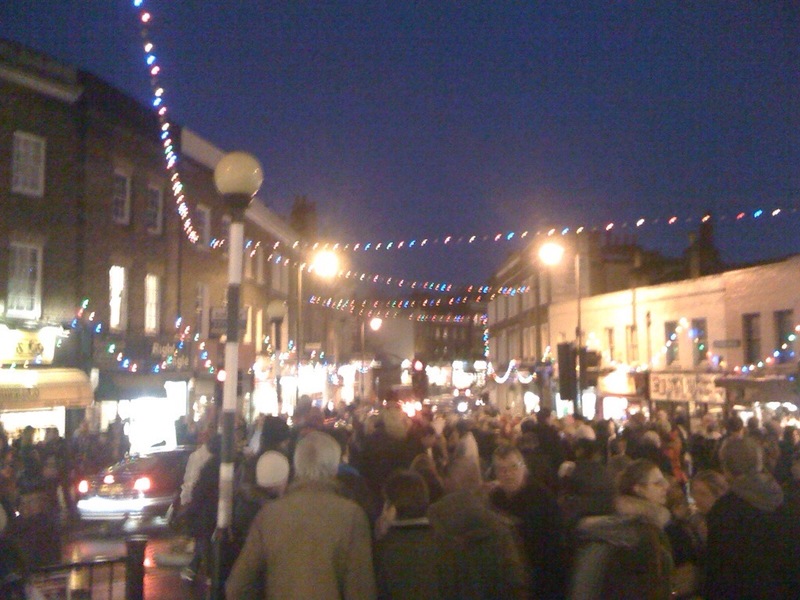 I’ve emailed the Blackheath Christmas Lights website, but not heard anything back yet. It would be a great shame if it were true- they’re very much part of what makes the village look so picturesque in the winter months. 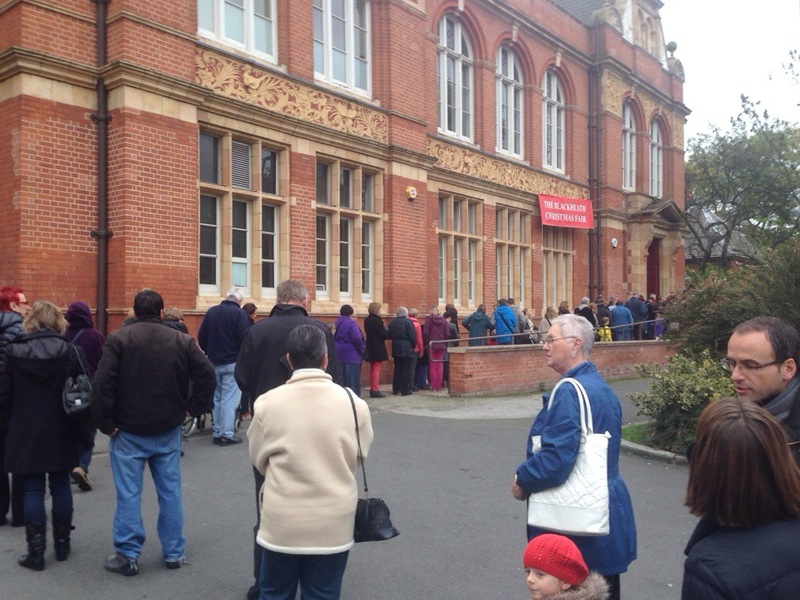 A few photos from the packed Christmas Fair. Open until 4pm today (Sunday). Don’t forget, it’s the Blackheath Christmas Fair today 10.30am-4pm. It’s in Blackheath Halls, and costs £1 to enter. All proceeds go to Age Exchange. Alan Williams, author of The Blackheath Seance Parlour will be selling signed copies of his book too. On sale will be a wide range of beautiful hand-crafted presents, most of which are not readily found on the high street. From cashmeres to award-winning ceramics, Bolivian knits to finger puppets, limited edition prints to jewellery, organic babywear and recycled bags, to enamel bowls and gorgeous Christmas decorations, spectacular Indian silks and kitchen linens. There will also be plenty to tempt the taste buds with gourmet delicacies including flavoured vodkas, hand crafted chocolates, plum rum, homemade saucy sauces and chutneys. Something for everyone to suit all pockets and with most items £10 and under. The Blackheath Christmas Fair has been organised by The Friends of Age Exchange, and local Blackheath based artist Fiona Bell-Currie. In an effort to keep it local, most of the selected independent traders and designers exhibiting are based in South East London and Kent. There’ll also be live music, face painting, a tombola and the opportunity to buy charity Raffle tickets at the Fair, with fantastic prizes, from a week’s self-catering accommodation for six on the Isle of Wight, to an original framed pastel by artist Fiona Bell-Currie. All proceeds from the door ticket sales (£1 entrance), and the Raffle go towards supporting the work of Age Exchange, a registered charity whose work using reminiscence based projects transforms the quality of life for older people. Proceeds will also support the volunteer-run lending library which shares its building with Age Exchange in the heart of Blackheath Village. Entrance to The Blackheath Christmas Fair is £1 adults, free to Friends of Age Exchange and under 16s. More details at http://www.friends-of-age-exchange.org.uk. Twitter @blackheathfair. Blackheath Halls 020 8463 0100. 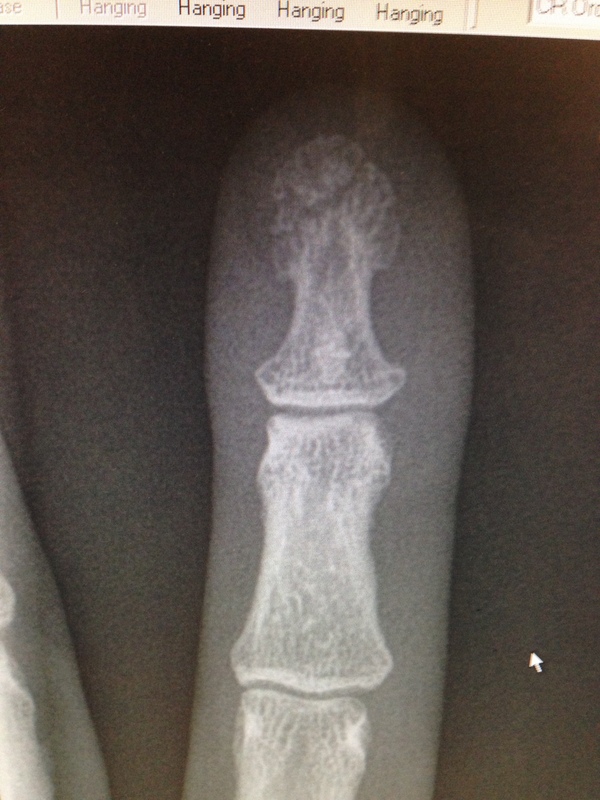 Last night, I slammed my left index finger in a car door. I’m left handed (of course). So I swore a bit, shouted at the long-suffering Mrs Bugle to get some ice, swore a bit more and went to bed. The next morning it was still hurting, and had gone a bit purple. Most of the nail was black. So I phoned NHS Direct, who asked me to answer several questions using computerised voice recognition to determine which council I live in. Then they told me that the service was no longer available in my area, and told me to call 111 instead. So I called 111, and spoke to a guy who got logged out of his system, then logged in again. He asked me a load of questions from a flow diagram, then told me I should go to my nearest A&E. So I went, for the first time ever to Lewisham’s A&E department. And they were brilliant. All my details were entered at reception. They knew who my GP was, and updated my records. A nurse saw me after a 5 minute wait, then I was sent to get an x-ray. Look! Apparently it’s got a tiny fracture at the top. Then I was sent to another nurse, who already had the x-ray up on her computer, then decided to cut a hole in the top of the fingernail, and drain some blood out of the finger (fun!). All the staff were friendly and helpful. Then it was bandaged up, I was given some painkillers, plasters, and some anti-biotics, and now I’m at home typing with even less skill than usual. I’m extremely glad that Jeremy Hunt hasn’t yet managed to close my nearest A&E department, or to downgrade it. He won’t bother closing hospitals in areas where there are lots of his voters, only in areas where there are lots of poor people, like Lewisham. However, having lost this battle, he now wants to change the law, so that he can carry on screwing up our hospitals. You need to sign this petition, and with a bit of luck, next time you slam your finger in a car door, you’ll have as good a level of service as I just did. Police in Greenwich have released CCTV footage of a distraction theft at a cash point outside Barclays bank in Vanbrugh Park, SE3. Officers are asking the public to assist in identifying three men suspected of being involved. The incident occurred on Tuesday, 10 September at approximately 14:00hrs when the victim, a man aged 82, was at the cash point and while waiting for his money he was distracted by a man standing behind him. The suspect was speaking in a foreign language and kept pointing at a £10 on the floor by the victim’s feet, implying he had dropped it. The victim subsequently bent down to pick up the £10 note. When he stood back up, he noticed his card and £50 cash had been taken. The victim saw the suspect walk away with two other men. The victim was unharmed. Anyone with information regarding this incident is asked to call the Burglary Squad on 020 8284 9449 or alternatively call Crimestoppers anonymously on 0800 555 111. Gary writes on Facebook that there have been a few of these in Blackheath village too.